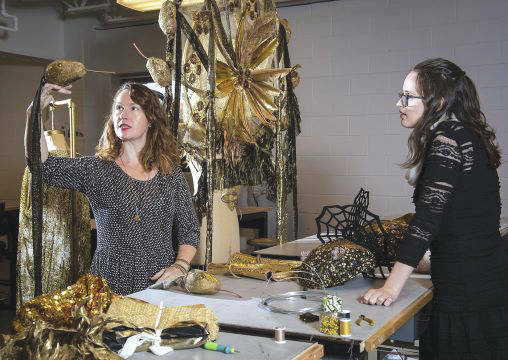 Elizabeth Bourgeois, assistant professor of costume design, worked with a team of Wright State students and alums to create the winning costume. Submitted photos Costume created by Elizabeth Bourgeois, assistant professor of costume design, won the annual HighBall Halloween fashion show and party in Columbus. FAIRBORN — She got the idea while leafing through a book about snakes with her 9-year-old daughter. 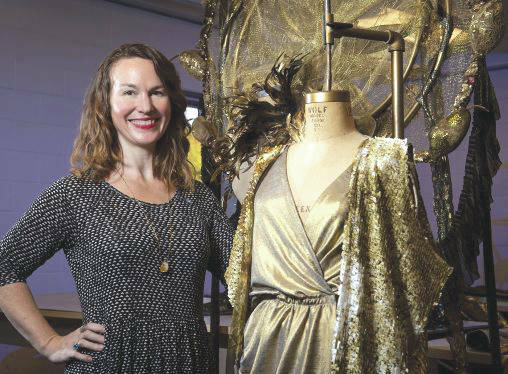 The inspiration led Elizabeth Bourgeois, assistant professor of costume design at Wright State University, to create a glittering gold gown with a towering snake-ringed headdress and a train of sequined snakes that make a slithering sound. The spectacular costume was among eight from around the nation picked in a juried selection process to compete in HighBall Halloween, a wild street party in the Short North Arts District of Columbus that in its 10 years has grown to become the third largest fashion runway event in the country. And when the judging was over at the Oct. 27 event, Bourgeois and her team of Wright State students and graduates had taken first place. The competition included designers from New York City, Boston and other fashion centers. HighBall is a fashion event but with theatrics more akin to a rock concert. High Street is blocked off, a 60-foot-long fashion runway is constructed, and an elaborate lighting system is set up. HighBall has attracted up to 40,000 people, many of whom wear their own costumes. Each designer created three ready-to-wear outfits and one couture costume, which was constructed by hand with extreme attention to detail and often with unusual fabric. The couture show is the culmination of three days of HighBall activities. In the past, models in the couture show have worn costumes that look like bridges, hot air balloons and even ships that bob on ocean waves. Since HighBall centers on Halloween and occurs outside at night, Bourgeois knew that her costume had to be big, be able to catch the lights and be visible from a good distance away. In doing some research, Bourgeois discovered Manasa the Hindu Snake Goddess, a mythical figure sheltered by the hoods of seven cobras and worshipped for fertility and prosperity. Bourgeois used that snake-idol concept to create the gown and headdress that together are more than 10 feet tall and an eight-foot-long train that trails behind the six-foot-tall professional model wearing six-inch heels. The model was accompanied by two dancing attendants waving staffs crowned with snake puppet heads with eyes that light up. “When model Annie DeChellis took the stage in this crazy metallic Medusa gown there were gasps and cheers,” said Bourgeois. Bourgeois started working on the costume in the middle of August with the help of Wright State students and alums. Her design assistant, Emily Sollinger, graduated two years ago from Wright State’s design technology program and now works for the Dayton Ballet. Lauren Everett is a musical theatre alumna, Christine Fiala is a senior acting major, Lexi Black is a Columbus-based model, and the snake-head staffs were carried by attendants Nick Wasserbauer and Emma Buchanan, musical theatre majors. The costumes were kept under wraps until the show, with the designers being sworn to secrecy. Even the Greater Columbus Convention Center, where the costumes were assembled before the runway event, was locked down. Bourgeois’ costume was the fifth one on the runway. https://www.xeniagazette.com/wp-content/uploads/sites/32/2018/11/web1_Elizabeth-Bourgeois-20591_019-508×360.jpgElizabeth Bourgeois, assistant professor of costume design, worked with a team of Wright State students and alums to create the winning costume. https://www.xeniagazette.com/wp-content/uploads/sites/32/2018/11/web1_Elizabeth-Bourgeois-costume-20591_008-2-508×374.jpgSubmitted photos Costume created by Elizabeth Bourgeois, assistant professor of costume design, won the annual HighBall Halloween fashion show and party in Columbus.